Sensation is a red-coloured sport (natural mutation) of the popular Williams pear variety. The skin has a red flush and the leaves may also develop a red tint. The flavour is very good, and growth characteristics are similar to Williams. Please fill in the details below and we will let you know when Sensation pear trees are back in stock. 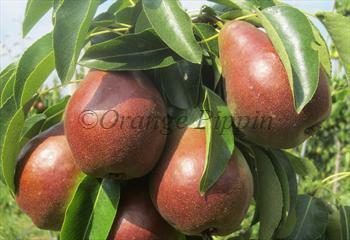 Williams is a classic English pear, also known as Bartlett, with good flavour and quite easy to grow. Drying / Discoloring: Slightly oxidising? Sensation is in flowering group 3. Sensation is self-sterile and needs to be pollinated by another tree of a different variety nearby. Since it flowers in the middle of the blossom season it can be pollinated by most other pear trees. Like Williams, Sensation can be grown throughout the drier areas of the UK.